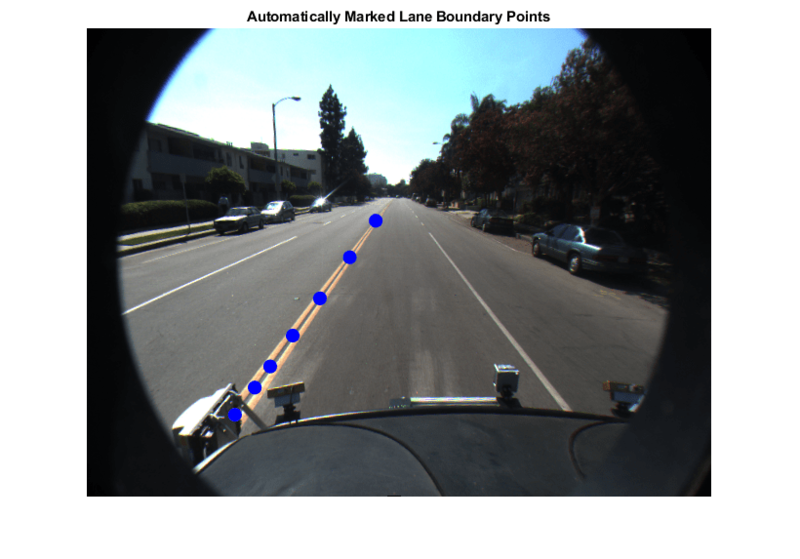 This example shows how to develop an algorithm for the automated marking of lane boundaries in the Ground Truth Labeler app. Good ground truth data is crucial for developing driving algorithms and evaluating their performances. However, creating a rich and diverse set of annotated driving data requires significant time and resources. The Ground Truth Labeler app makes this process efficient. You can use this app as a fully manual annotation tool to mark lane boundaries, vehicle bounding boxes, and other objects of interest for a vision system. However, manual labeling requires a significant amount of time and resources. This app also provides a framework to create algorithms to extend and automate the labeling process. You can use the algorithms you create to quickly label entire data sets, and then follow it up with a more efficient, shorter manual verification step. You can also edit the results of the automation step to account for challenging scenarios that the automation algorithm might have missed. This example describes how to insert a lane detection algorithm into the automation workflow of the app. First, create a lane detection algorithm. 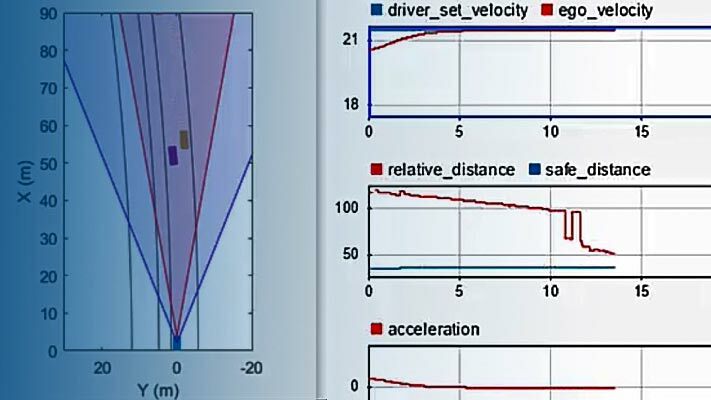 The Visual Perception Using Monocular Camera example describes the process of detecting lane boundaries, and the helperMonoSensor class packages that algorithm into a single, reusable class. Try out the algorithm on a single video frame to detect the left ego lane boundary. The lane detected in the previous step is a model and must be converted to a set of discrete points. These points are similar to what a user might manually place on the image. 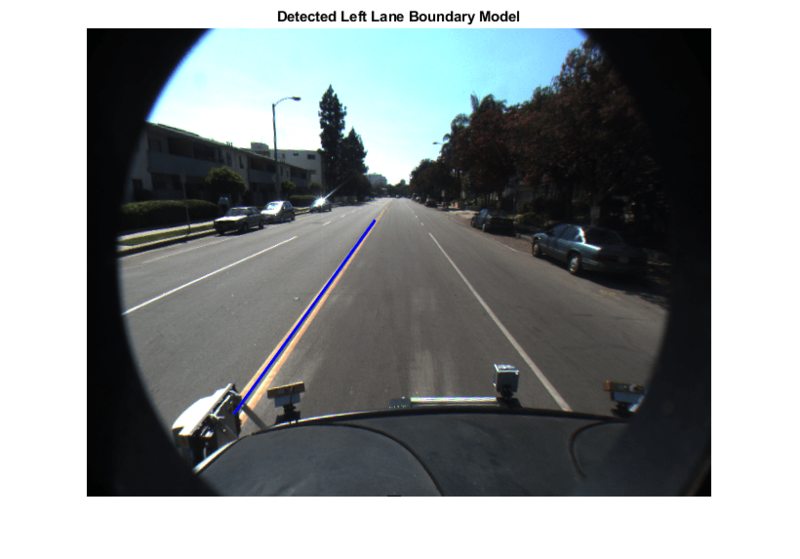 In the camera view, parts of the lane boundary closer to the vehicle (lower part of the camera image) will span more pixels than the further parts. Consequently, a user would place more points with higher confidence in the lower parts of the camera image. To replicate this behavior, determine the lane boundary locations from the boundary model more densely at points closer to the vehicle. To incorporate this lane detection algorithm into the automation workflow of the app, construct a class that inherits from the abstract base class vision.labeler.AutomationAlgorithm. This base class defines properties and signatures for methods that the app uses for configuring and running the custom algorithm. The Ground Truth Labeler app provides a convenient way to obtain an initial automation class template. For details, see Create Automation Algorithm for Labeling (Computer Vision Toolbox). The AutoLaneMarking class is based off of this template and provides you with a ready-to-use automation class for lane detection. The comments of the class outline the basic steps needed to implement each API call. Step 1 contains properties that define the name and description of the algorithm, and the directions for using the algorithm. %         includes Name, Description, and UserDirections. % Name: Give a name for your algorithm. % Description: Provide a one-line description for your algorithm. %                 representing a step in the list of directions. Step 2 contains the custom properties needed for the core algorithm. The necessary properties were determined from the lane detection and lane point creation section above. The next function is checkSetup. Note that this algorithm requires a monoCamera sensor configuration to be available. All other properties have defined reasonable defaults. Next, the settingsDialog function obtains and modifies the properties defined in Step 2. This API call lets you create a dialog box that opens when a user clicks the Settings button in the Automate tab. To create this dialog box, use the inputdlg function to quickly create a simple modal window to ask a user to specify the monoCamera object. The following snippet of code outlines the basic syntax. The full AutoLaneMarking code extends this logic and also adds input validation steps. Step 4 specifies the execution functions. Some automation algorithms need to implement an initialize routine to populate the initial algorithm state based on the existing labels in the app. This lane detection algorithm works on each frame independently, so the default version of the template has been trimmed to take no action. Next, the run function defines the core lane detection algorithm of this automation class. run gets called for each video frame, and expects the automation class to return a set of labels. The run function in AutoLaneMarking contains the logic introduced previously for the lane detection and conversion to points. Code from helperMonoSensor has also been folded in for a more compact reference. Finally, the terminate function handles any cleanup or tear-down required after the automation is done. This algorithm does not require any cleanup, so the function is empty. Create the folder structure required under the current folder, and copy the automation class into it. Load the monoCamera information into the workspace. Open the Ground Truth Labeler app. On the left pane, click the Define new ROI label button and define the ROI line style shown. Then click OK.
Click Algorithm > Select Algorithm > Refresh list. Click Algorithm > Auto Lane Detection. If you do not see this option, ensure that the current working folder has a folder called +vision/+labeler, with a file named AutoLaneMarking.m in it. Click Automate. A new tab will open, displaying directions for using the algorithm. Click Settings, and in the dialog box that opens, enter sensor in the first text box. Modify other parameters if needed before clicking OK.
Click Run. The lane detection algorithm progresses on the video. Notice that the results are not satisfactory in some of the frames. After the run is completed, Use the slider or arrow keys to scroll across the video to locate the frames where the algorithm failed. Manually tweak the results by either moving the lane boundary points or deleting entire boundaries. Once you are satisfied with the lane boundaries for the entire video, click Accept. The auto lane detection part of labeling the video is complete. You can proceed with labeling other objects of interest, save the session, or export the results of this labeling run. This example showed the steps to incorporate a lane detection algorithm into the Ground Truth Labeler app. You can extend this concept to other custom algorithms to simplify and extend the functionality of the app.